Basketball is a non-contact sport, but it isn’t golf we’re talking about either. Sometimes being in such close proximity with bumps and jostles going on, 1-on-1 matchups can get pretty emotional. And sometimes, just sometimes, it actually boils over. 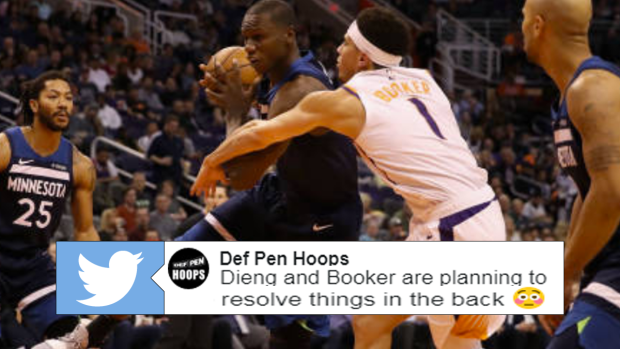 That was the case on Tuesday when Gorgui Dieng caught Devin Booker with an elbow in the paint. It’s hard to say whether the elbow itself had any intention behind it, but Booker certainly thought it did. You can see Booker trying to break free of the security guard, a guy who may have been the reason why nothing more came of the matter. It is not clear whether either player will face further discipline, but if a similar incident between Kyle Lowry and Ben Simmons means anything, we may not.